Children’s bedrooms usually require designs which are both creative and simplistic. The children’s bedroom in this project was especially designed with these two adjectives in mind. On the one hand, the design is uniquely creative, bringing these colourful figures alive in the room, whilst on the other hand, the fact that they are printed on wood and not glass, makes the project less expensive. This enables the design to change over time as many children’s rooms often do. In addition, the use of Hardoor’s “floating” system instead of the Sesame level doors system is more suitable for maturer inhabitants of the room. 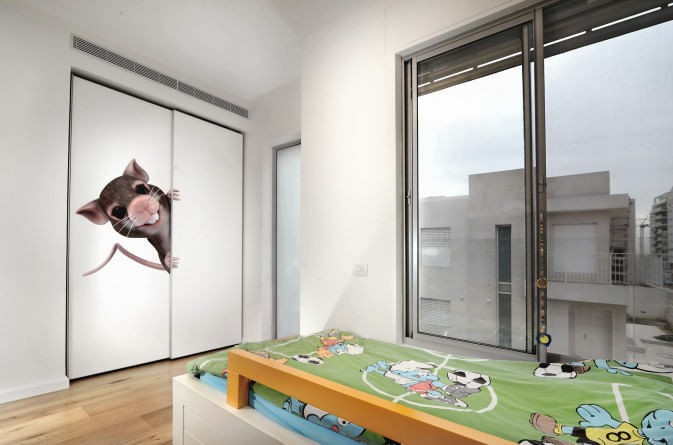 The use of the “floating” system is sensible in bedrooms for very young children as it is well known that children’s bedroom designs change as the children grow up. So here is another example of a fun, simplistic design with advanced sliding mechanisms, creating a uncompromising merger of creativity and simplicity.